Amsterdam-based duo Formafantasma and architectural materials brand Dzek collected volcanic ash from Mount Etna in Italy to glaze this "totally 1970s" collection of surface tiles. Presented at Milan design week, which took place between 9 and 14 April, the ExCincere collection of volcanic ash-glazed porcelain tiles are rectangular and feature yellow-brown tones. "Generally we are never retro in our work, but this just came out and it's totally 1970s, it definitely speaks of the decade," said the designers. Suitable for both indoor and outdoor surfaces, the tiles are available in two sizes and five volcanic glazes. They are glazed using volcanic ash from Mount Etna in Sicily, Italy, which consists of fragments of pulverised rock, including basalt rock – a magnesium and iron-rich volcanic rock created by the rapid cooling of lava. "Mount Etna is a mine without miners; it is excavating itself to expose its raw materials," said Formafantasma. The collection aims to demonstrate the "full potential" of volcanic ash, which is described by Formafantasma as "naturally-occurring, self-generating, and abundant". "Like César Manrique's evocative Lanzarote architecture, which so seamlessly integrates into its surrounding volcanic landscape, ExCinere is a new take on the tradition of volcanic lava as a building material and a manifest of the enduring attraction between humans and the impossible force of nature," said Dzek. The project follows on from Formafantasma's 2014 project De Natura Fossilium – a series of homeware objects made of basalt rock formed after Mount Etna erupted in 2013. Formafantasma and Dzek built on this existing research to investigate the uses of volcanic ash in creating architectural materials, like tiles. Ash has a high metal-oxide content, which makes it "complex and unpredictable to work with". 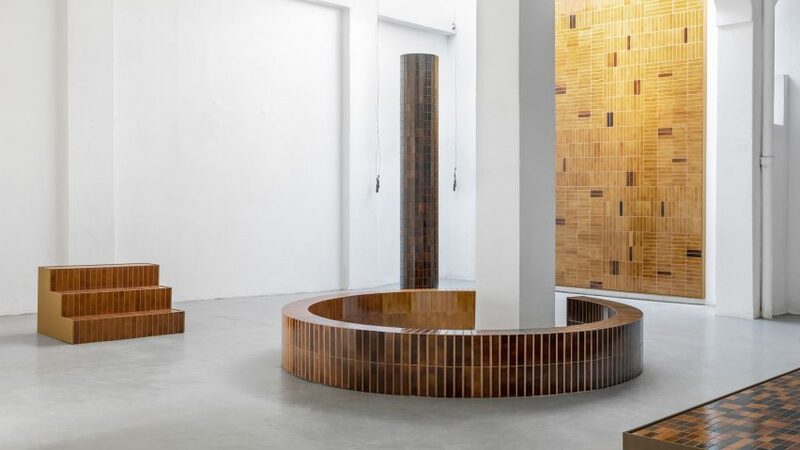 The designers spent nearly two years examining the exact balance of porcelain tile, ash glaze, firing temperature and method to prevent the pieces cracking or exploding during the firing process. "Although volcanic ash and basalt rock may appear inert, their metal-oxide content makes them complex to work with," said Dzek. "The material has its own will and you have to allow it to go where it needs to." "Identifying the right balance of volcanic ash percentages, granule sizes, densities, firing temperatures, firing methods and clay body took almost 20 months to be exact," explained the brand. The five different colour glazes were created by mixing varying amounts and densities of volcanic matter. "The lighter glazes use extremely fine ash powders. The glazes become increasingly darker and more specked as the ash particles increase in size and frequency," said Dzek. These glazes were then applied onto the porcelain tile bodies and fired in a kiln. "The glossy tones achieved from mixing and firing varying percentages and densities of volcanic matter are evocative of the dynamic landscape from which they come," explained Dzek. The full range of colours of the collection were displayed in Milan in an installation at a satellite of the Alcova site on Via Popoli Uniti. The two brands showed the products as tiled wall panels, steps, shelves, columns and low benches, as well as a wall-mounted block with an indented tiled nook. "We wanted to show the possibilities and how it could become an entire architecture," explained Formafantasma. Also on show at Milan design week was a set of flat-packed furniture essentials by Panter & Tourron and an installation of geometric totem poles by Note Design Studio.